New “Prufrock” pages coming up! 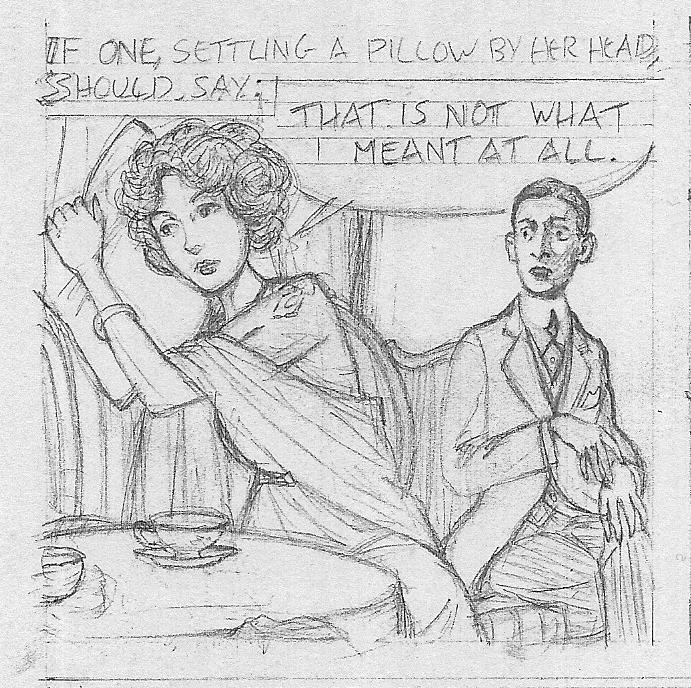 I have just finished the final pencil version of another section of my comic book adaptation of T. S. Eliot’s “The Love Song of J. Alfred Prufrock,” and will now begin inking it. This instalment begins with “the afternoon, the evening,” napping cat-like on the floor and concludes with Prufrock’s love-interest lamenting that “that is not what I meant at all.” Hopefully, after reading the final version, you won’t be left feeling Eliot would have a similar complaint! This entry was posted in "The Love Song of J. Alfred Prufrock" by T.S. Eliot, comic book poetry, Poetry, Poetry Comics and tagged graphic poetry, T. S. Eliot, that is not what i meant at all. Bookmark the permalink. 9 Responses to New “Prufrock” pages coming up! Oh, I can’t wait! Have you considered Coleridge’s Rime of the Ancient Mariner?! Oh, we must not ask, “what is it?”! I’m so glad! (about the next page, not about no world/time to do the 4 quartets). Thanks! As for 4 Q, Well, I might have enough world, but it’s the time that’s lacking. But I hope I can inspire some other comics artist is inspired to tackle them! Ha! Four Quartets in comics would be great! Had I but world enough and time!